Marcelo Baeza was born in Ojinaga, Chihuahua, Mexico in 1853, the son of Candelario Baeza and Filomena Ramos. He was baptized in Jesus Nazareno Temple, Ojinaga January 18, 1853. He married Luciana Ramirez in the same church November 28, 1873. She was born in Ojinaga in 1852, the daughter of Luis Ramirez and Dominga Leyva. See http://www.lifebeforetheruins.com/marcos-ramirez.html for her family information. In 1880 Marcelo and Luciana and their first four children were living in the Fort Stockton area, where Marcelo was working as a farmer. They had eleven children. 1. Rosa, 2. Pablo, 3. Braulia, 4. Placida, 5. Concepcion, 6. Candelario, 7. Victoria, 8. Fernando, 9. Teresa, 10. Francisca, 11. Juan. A. Son Panteleon Dominguez was born July 27, 1899. He was baptized May 20, 1900 in Terlingua by Father Brocardus. His godparents were William Taylor and Francisca Mores. B. Son Francisco Dominguez was born in Texas in 1900. He was a ranch laborer. He died at his home in Fort Stockton December 26, 1959 of heart problems and is buried in the Fort Stockton Catholic Cemetery. C. Daughter Juana Dominguez was born November 24, 1904. She was baptized in Terlingua by Father Brocardus February 26, 1905. Her godparents were Lucas Acosta and Aurelia Hinojos. D. Daughter Rita Dominguez was born May 22, 1906 in Terlingua. She was baptized in Terlingua by Father Brocardus January 13, 1907. Her godparents were Casiano Gonzalez and Catrina Castro. E. Daughter Maria Dominguez was born January 5, 1910. She was baptized in “Castelon, Terlingua” April 29, 1910 by Father Brocardus. Her godparents were Jose David and Maria Villa. F. Son Escolastico Dominguez was born in Castolon November 8, 1913. H. Son Tomas Dominguez, Jr.
2. Son Pablo Baiza (a) was born in 1876, probably in the Fort Stockton area. Circa 1905 he married Nona Dodson, daughter of William Harve Dodson and Minnie Maude Crumpton. Nona was born circa 1888 and lived with her family on a ranch at the southern base of the Chisos Mountains. Pablo and his family lived at various locations downriver from Castolon, sometimes in Mexico and sometimes Texas. Pablo and son Adolfo were implicated in the deaths of two Garcia men in 1930. After a trial Adolfo was ruled not guilty, and charges against Pablo eventually were dropped. Nona died in Reagan County, Texas July 6, 1979. (1) Son Juan Garcia was deceased by January 2006. (2) Daughter Manuela Garcia was living in Fort Stockton in January 2006. Her married name is Bernal. (3) Daughter Paula Garcia was living in Fort Stockton in January 2006. Her married name is Chavez. (4) Daughter Belia Garcia was living in Fort Stockton in January 2006. Her married name is Vislar. (5) Son Armando Garcia was living in Fort Stockton in January 2006. (6) Son Francisco Garcia was living in Fort Stockton in January 2006. (7) Son Hector Garcia was living in Midland in January2006. (8) Son Santos Garcia was living in Mexico in January 2006.
a. Son Alfredo Guzman was deceased by January 2006.
b. Daughter Dora Guzman was living in Fort Stockton in January 2006. Her married name is Lozano. c. Daughter Josie Guzman was living in San Antonio in January 2006. Her married name is Knight. d. Daughter Lilly Guzman was living in Lajitas, Texas in January 2006. Her married name is Solis. e. Daughter Delma Guzman was living in McCamey, Texas in January 2006. Her married name is Munoz. a. Son Juan Garcia Lechler, Jr. was living in Fort Stockton in January 2006.
b. Son Horacio Garcia Lechler was living in Fort Stockton in January 2006.
c. Daughter Marcela “Marcy” Lechler was living in Fort Stockton in January 2006. Her married name is Gonzalez. a. Son Augustine Baiza was born in Brewster County July 23, 1948.
b. Son Carlos Baiza was born in Upton County July 27, 1952.
c. Daughter Yolanda Baiza was born in Crockett County September 24, 1953.
d. Daughter Juanita Baiza was born in Upton County March 31, 1960.
e. Son Leandro Baiza was born in Crane County January 19, 1964.
f. Daughter Rena Ester Baiza was born in Upton County April 12, 1968.
a. Daughter Mary Ann Baiza was living in Hereford, Texas in April 2002. Her married name is Montano. b. Daughter Hermalinda B. Baiza was living in San Angelo, Texas in April 2002. Her married name is Castillo. c. Daughter Deborah K. Baiza was living in Hobbs, New Mexico in April 2002. Her married name is Enriquez. d. Son Jacobo R. Baiza, Jr. was living in Hobbs, New Mexico in April 2002.
e. Son John Baiza was living in Hobbs in April 2002.
f. Son Michael L. Baiza was living in Hobbs in April 2002.
g. Son Jaime Garza was living in Hobbs in April 2002. (3) Son Adolfo Baiza was living in Odessa in June 2011. (4) Son Antonio “Tony” Baiza was born August 11, 1934. In April 2002 he was living in Hobbs, New Mexico. He died there November 6. 2006.
a. Son Epifanio Baiza, Jr. was born November 18, 1963 in Midland. He was living in Midland in June 2011.
b. Daughter Norma Jean Baiza was born January 7, 1966 in Crane County, Texas. She was living in Odessa in June 2011. Her married name is Berdoza. c. Son Rene Dornell “Ray” Baiza was born August 12, 1972 in Midland. He died November 29, 1972 of hypoxia in University of Texas Medical Branch Hospitals, Galveston and is buried in the Odessa Cemetery. aa. Son Michael Alan Baiza II was born August 11, 1996 in Ector County. e. Son Jeffrey Ray Baiza was born March 19, 1976 in Ector County. He was living in Odessa in June 2011.
f. Daughter Kristen Ann Baiza was born July 5, 1981 in Ector County. She was living in Odessa in June 2011. Her married name is Muñoz. (6) Son Romolo Baiza was living in McCamey in June 2011. (7) Son Pascual Baiza was living in Dallas in June 2011.
a. Daughter Luz Divina Hinojosa was born March 21, 1955 in Upton County. b. Son Armando Hinojosa Jr. was born June 3, 1957 in Upton County. c. Daughter Alice Hinojosa was born November 5, 1958 in Upton County. 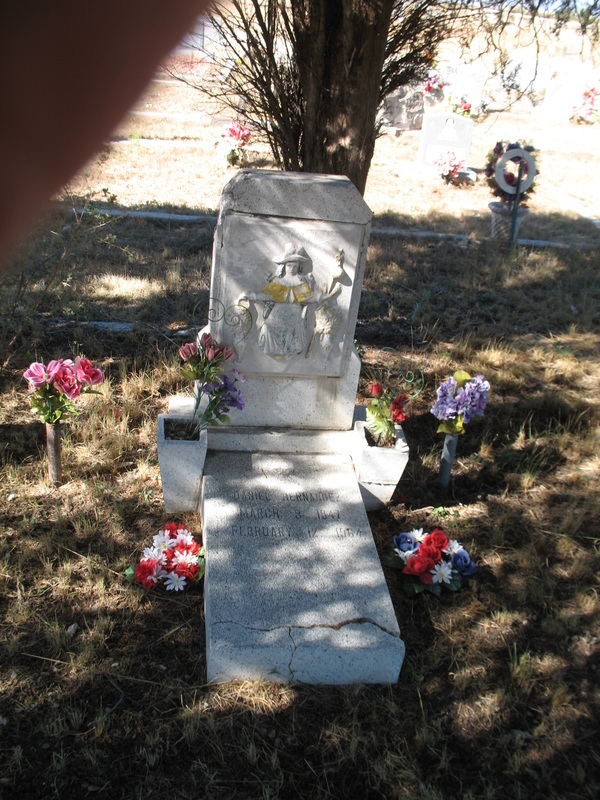 She died February 21, 1959 in McCamey of pneumonia and is buried in the McCamey Cemetery. d. Daughter Delfina Hinojosa was born January 10, 1960 in Upton County. e. Daughter Alicia B. Hinojosa was born December 8, 1964 in Crane County. f. Daughter Isabel Hinojosa was born May 24, 1966 in Upton County. (9) Daughter Maria “Mary” Baiza was living in Hobbs, New Mexico in June 2011. Her married name is Hernandez. (10) Daughter Dora Baiza was living in Del Rio, Texas in June 2011. Her married name is Grupe. (1) Daughter Juliana Baiza was born circa 1927 in Texas. In December 2010 she was living in Ojinaga, Chihuahua, Mexico. Her married name is Dominguez. a. Daughter Asucena Yharte was living in Midland in January 2007.
b. Son Wencelado Yharte, Jr. was living in Cyprus, Texas in January 2007. His wife’s name is JoAnn. a. Son Oscar Rodriguez, Jr. was born September 25, 1953 in Ector County. b. Son Llano Rodriguez was born May 12,1957 in Ector County. a. Son Larry Baiza was living in Odessa in December 2010. His wife’s name is Stacey. a. Son Fernando Carnero, Jr. was born in Midland March 20, 1958 and was living there in April 2009.
b. Son Michael Carnero was living in Midland in April 2009.
c. Daughter Rosemary Carnero was living in Midland in April 2009. Her married name is Miranda. d. Son Sammy Carnero was living in Midland in April 2009.
e. Daughter Gloria Carnero was living in Midland in April 2009.
f. Daughter Diana Carnero was living in Midland in April 2009. Her married name is Castillo. g, Daughter Alice Carnero was living in Midland in April 2009.
a. Son David Baiza . b. Son Adolfo Baiza III was living in Midland in August 2011.
a. Daughter Claudia Ann Baiza was born June 13 1973 in Crane and died the next day in Crane Memorial Hospital. She was three months premature. 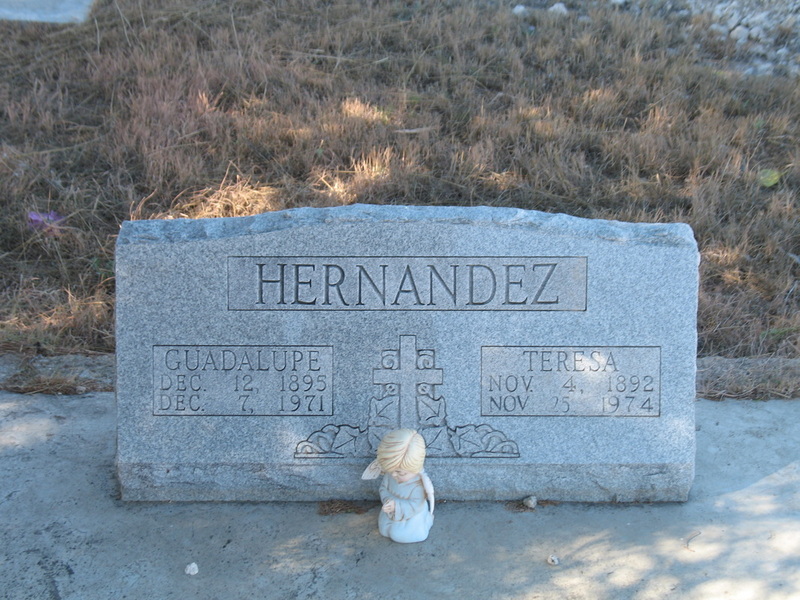 She is buried in Resthaven Baby Land Cemetery in McCamey. b. Son Israel Baiza married Cecelia Maria Zamora. They had one child. aa. Son Claudio Baiza II was born December 7, 1987 in Upton County..
(8) Daughter Helen Baiza was living in Midland in December 2010. Her married name is Ramirez. (9) Daughter Leonila “Nellie” Baiza was living in Arlington, Texas in December 2010. (10) Son Gilberto Baiza was deceased by December 2010. (11) Daughter Margarita Baiza was living in Midland in December, 2010. Her married name is Ramirez. (1). Daughter Simona Avila was born February 18, 1932 in Castolon. In May 1998 she was living in Odessa. He married name was White. (2). Son Jacobo Avila, twin of Dolores, was born in Castolon January 26, 1934. (3). Daughter Dolores Avila, twin of Jacobo, was born in Castolon January 26, 1934. (4) Daughter Maria Avila was born in Alpine June 2, 1945. Her home was in Rankin, Upton County, Texas when she died. She died in Odessa November 26, 1976 and is buried in Sheffield Cemetery, Pecos, Texas. Her married name was Rodriguez. (5). 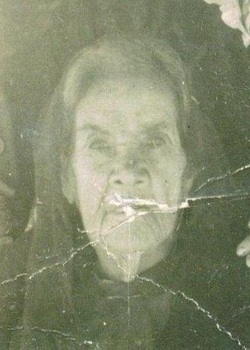 Daughter Guadalupe Avila was living in Odessa in May 1998. Her married name was Alvarez. (6). Son Billy Joe Avila was living in Teague, Texas in May 1998. E. Son Pablo Baiza was born February 7, 1914 in Castolon, Texas. He was baptized in Chisos, Texas November 19, 1916 by Father Antonio Alonso from St. Agnes Catholic Church in Terlingua. His godparents were Doroteo and Sabina Aranda. He died in Upton County, Texas August 21, 1982. F. Daughter Isidora Baiza was born April 4, 1916. On July 26, 1931 she married Santos Villalba, the son of Federico Villalba and Maria Cortez. Santos was born in the Terlingua area November 1, 1907. They were married in Terlingua by Justice of the Peace Robert L. Cartledge. (1). Son David Villalba, Sr.
(2). Son Jacob "Jake" Villalba was born May 17, 1935 in Alpine. He died February 17, 2011 in San Martin, California. (3). Son Santos “Blocker” Villalba, Jr., was born November 29, 1937. (4). Son Jorge Villalba was born May 29, 1949 in Brewster County. David, Jacob and Santos, Jr.
(1) Son Marcos Baizaa was born June 11, 1941 in Alpine. (1) Son Pablo Garcia was born June 30, 1941. He died February 16, 1999 in Fort Stockton. (2) Son Florentino Garcia, Jr. was born June 16, 1946 in Brewster County. He was deceased by March 2006. (3) Daughter Ricarda Baiza Garcia was born July 2, 1949 in Texas. She died in Medical Center Hospital July 26, 1973 from gunshot wounds. On July 22 she was shot three times with a revolver in her home in Fort Stockton. She was employed as a waitress in a café at the time of her death. (4) Daughter Maria Elisa Garcia was born May 5, 1952 in Brewster County. In March 2006 she was living in Odessa. Her married name is Flores. (5) Son Roberto Garcia was born August 4, 1954 in Brewster County. In March 2006 he was living in Fort Stockton. (7) Daughter Sylvia Garcia was born in Tom Green County December 18, 1958. She was living in Fort Stockton in March 2006. Her married name is Garrison. (8) Daughter Norma Linda Garcia was born September 7, 1964 in Pecos County. She was living in Alpine in March 2006. Her married name is Alvarado. (9) Daughter Delma Garcia was living in Midland in March 2006. Her married name is Callier. (10 Daughter Carmen Garcia was living in Alvin, Texas in March 2006. Her married name is Hernandez. (11 Daughter Juanita Garcia was living in Alpine in March 2006. Her married name is Munoz. (12) Daughter Irene Garcia was living in San Angelo, Texas in March 2006. Her married name is Juarez. A. Daughter Juana Dominguez was born in Texas circa 1900. B. Son Julian Dominguez was born in Texas on January 9, 1901 and was baptized in Terlingua April 21, 1901 by Father Brocardus. His godparents were William and Francisca Taylor. C. Son Domingo Dominguez was born on December 20, 1902 in Texas and was baptized in Terlingua on October 18, 1903 by Father Brocardus. His godparents were Martin Ramirez and Concepcion Sanchez. D. Son Manuel Dominguez was born in Texas on April 12, 1905 and was baptized in Terlingua on September 11, 1905 by Father Brocardus. His godparents were Luis Baeza and Pomposa Dominguez. In August 1954 he was living in Del Rio, Texas. E. Son Eugenio Dominguez was born in Texas on March 20, 1907. He was baptized in Terlingua on May 3, 1908 by Father Brocardus. His godparents were Benito Urias and Isidora Chavez. F Daughter Marcela Dominguez was born in Texas on April 9, 1909 and was baptized in Terlingua by Father Brocardus on October 31, 1909. His godparents were Luis Baeza and Pomposa Dominguez. G. Daughter Concepcion Dominguez was born in Terlingua December 8, 1910. Her husband’s name was Flores (given name not available) and they lived in Del Rio, Texas. She died there April 20, 1967 and is buried in San Felipe Cemetery, Del Rio. H. Daughter Aurelia Dominguez was born in Terlingua November 3, 1913. 4 Daughter Placida Baeza was born circa 1879 In Fort Stockton. She married Patricio Granado. They lived in the Terlingua and San Vicente areas from 1904 until at least 1917. .By 1921 they had moved to the village of San Antonio de los Alamos, Municipality of Ojinaga, Chihuahua, Mexico (southeast of the city of Ojinaga) and were still living in that area in 1930. They had eleven children and all except Eulalia were living with them in the San Antonio de los Alamos area in 1930. For details and more information on the Granado family, please see http://www.lifebeforetheruins.com/balbino-granado.html. 5. Daughter Concepcion Baeza was born March 12, 1880 in the Fort Stockton area. She married Tranquiliano Morales November 6, 1900 in Jesus Nazareno Temple, Ojinaga. 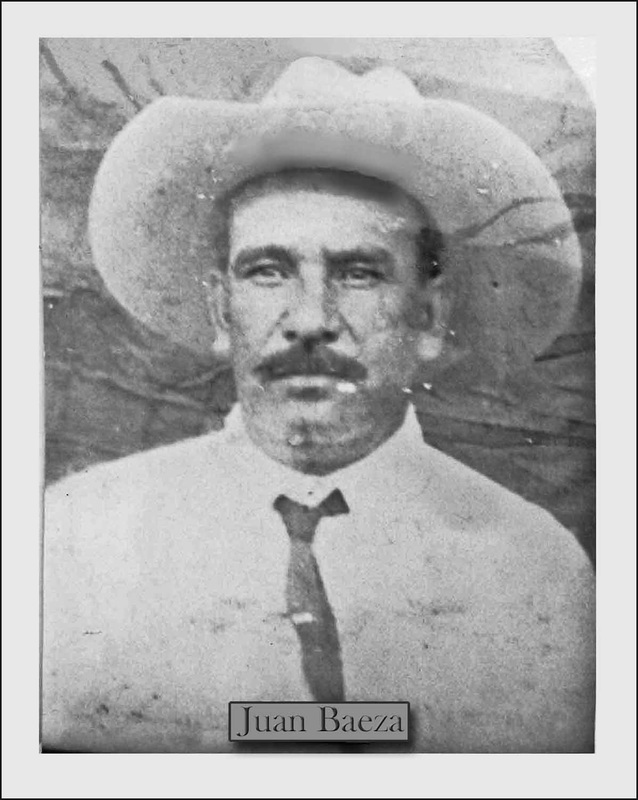 He was born in 1875 in Texas, the son of Juan Morales and Refugia Navarrete. Concepcion and Tranquiliano lived in the Terlingua area 1903 to 1918. Between October 1916 and April 1918 he earned $317.00 by selling nearly 51 cords of fuel wood to the Study Butte Mining Co. They eventually moved to Fort Stockton where Concepcion died of cardiac failure November 14, 1962. She is buried in the Fort Stockton Catholic Cemetery. Concepcion and Tranquiliano had eight children. (1) Daughter Josefa Chavarria was born in Brewster County July 26, 1935. (2) Son Francisco “Frank” Chavarria was born October 4, 1938 in Brewster County. He married Hortencia Salas, daughter of Eduardo and Margarita Salas. They had seven children. a. Son Frank Chavarria, Jr. In July 2007 he was living in Midland, Texas. b. Son Larry Chavarria. In July 2007 he was living in Imperial, Texas. c. Son Danny Chavarria. In July 2007 he was living in Alpine, Texas. d. Daughter Marissa Chavarria. She married Gilbert Singh. In July 2007 they were living in Fort Stockton, Texas. e. Daughter Gracie Chavarria, twin of Gabriel. She married Eddie Terrazas. In July 2007 they were living in Midland, Texas. f. Son Gabriel Chavarria, twin of Gracie. He died in Martin, Texas July 20, 2007.
g. Daughter Teresa Chavarria married Cipriano Amaro. In July 2007 they were living in Marfa, Texas. B. 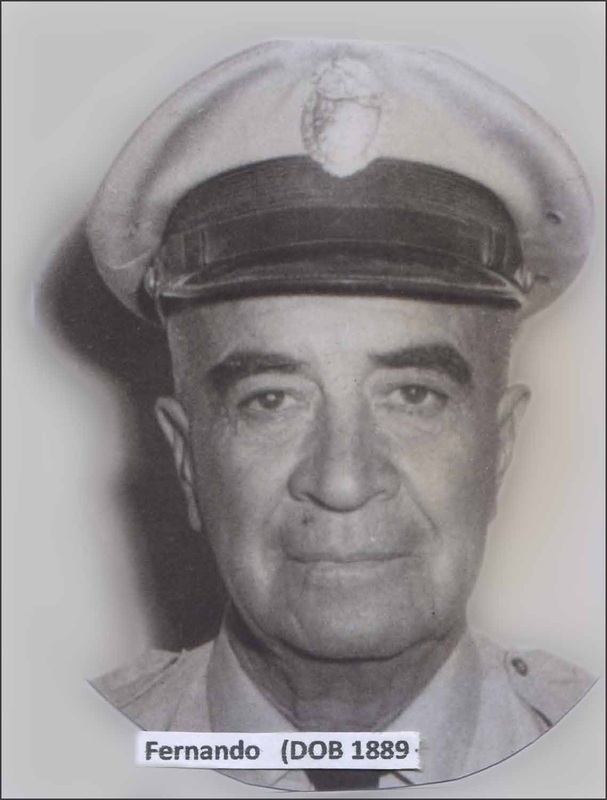 Son Florentino Morales was born March 14, 1905, probably in the Terlingua area. He was baptized by Father Brocardus in Terlingua on September 11, 1905. His godparents were Leandro Silvas and Maria Deanda. C. Daughter Teresa Morales was born May 23, 1907, probably in the Terlingua area. She was baptized September 16, 1907 by Father Brocardus in Terlingua. His godparents were Luis Baeza and Pomposa Dominguez. D. Son Jose Morales was born September 18, 1909, probably in the Terlingua area. He was baptized November 1, 1909 in Terlingua by Father Brocardus. His godparents were Leandro Silvas and Maria Deanda. E. Daughter Adelina Morales was born in Terlingua November 14, 1914. She died September 19, 1971 in Hall-Bennett Memorial Hospital, Big Spring, Texas. She is buried in Saint Joseph’s Catholic Cemetery, Fort Stockton. Adelina’s married name was Saenz. A. Daughter Catarina Baeza was born February 13, 1904 in Terlingua and was baptized there April 30, 1904 by Father Brocardus. Her godparents were Lucas Acosta and Aurelia Hinojos. She died December 18, 1996 in Fort Stockton and is buried in the Marathon Cemetery. Her married name was Payne. B. Son Manuel Baeza was born August 2, 1905 and was baptized November 12, 1905 in San Vicente, Texas. His godparents were Anastacio Gamboa and Victoria Baeza. This Manuel probably died as a child. C. Son Valentin Baeza was born May 21, 1907 and was baptized May 2, 1908 in Terlingua by Father Brocardus. His godparents were Eduardo Ramirez and Paz Dominguez. He died in Medical Center Hospital December 18, 1972 of a gunshot wound in the center of the forehead. The gun accidently discharged, according to the death record. He is buried in St. Joseph’s Cemetery in Fort Stockton. He was a resident of Fort Stockton and was working as a ranch laborer at the time of his death. (1). Son Joe Garcia was living in Odessa in January 2005. F. Son Marcelo Baeza was born July 24, 1913 in Castolon and died in Iraan, Texas July 21, 1984. (1) Son Manuel Baeza died at birth. (2) Daughter Florinda Baeza was living in Fort Stockton in January 1994. Her married name was Ramirez. (3) Daughter Maria Elena Baeza was living in Fort Stockton in January 1994. Her married name was Villarreal. (4) Daughter Martha Della Baeza was living in Fort Stockton in January 1994. Her married name was Villarreal. (5) Son Elpidio Baeza was living in Fort Stockton in January 1994. (6) Son Alvaro Baeza was living in Fort Stockton January 1994. (7) Son Julio Baeza was living in Odessa in January, 1994.
a. Daughter Erica Baeza was born August 25, 1980 in Pecos County. a. Son Eric Lee Baeza was born November 28, 1984 in Jim Wells County. b. Son Ramon Baeza was born February 16, 1986 in Duval County. c. Son Dogoberto Baeza was born August 8, 1987 in Nueces County. d. Daughter Cassandra Lee Baeza was born June 19, 1989 in Kleberg County. (11) Son Sesilio “Chilo” Baeza was born May 15, 1940. He died in an automobile accident June 21, 1992 and is buried in St. Joseph’s Cemetery in Fort Stockton. He married Alicia P. Martinez and they had one child. aa. Son Sergio Sesilio Ramirez was born May 29, 1998.
bb. Son Aldric Jaeden Ramirez was born April 4, 2009. H. Son Valeriano Baeza was born in Mexico in 1919 and died of heart failure in 1983. He worked as a rancher most of his life. He married Maria Delgado and they had one adopted child. (1) Adopted son Jose Luis Baeza, biological son of Manuel Baeza and Maria Sanchez, was living in Fort Stockton in 1972, where he completed high school. He served in the U.S. Army from 1972 until 1976, then began his law enforcement career with the Dallas Police Force. Later he taught high school. His wife’s name is Roxana and they have two children. aa. Daughter Lailah Jayde Gomez was born November 5, 2009. She was living in Midland in August 2012..
J. Son Julian Baeza was born June 26, 1923 in Mexico. He was living in Fort Stockton in 2000 and 2007. He died in Belton, Texas May 7, 2010. He married Josefa Sotelo, the daughter of Victor Sotelo, Sr. and Guadalupe Moreno. She was born in Glenn Springs, Texas September 18, 1928 and died in Hospice House, Odessa January 29, 2007. She is buried in Rose Hill Cemetery, Odessa.For information on her family history, see http://www.lifebeforetheruins.com/victor-sotelo.html . (1) Son Julian Baeza, Jr. was born May 2, 1954 in Pecos County. He was living in Arlington, Texas in 2007 and in Arizona in 2010. (2) Daughter Albina Baeza was living in Fort Stockton in May 2010. Her married name is Gonzalez. (3) Daughter Guadalupe Baeza was living in Odessa in May 2010. (4) Daughter Marinella Baeza was living in Belton, Texas in May 2010. He married name is Vasquez. (5) Son Armando Baeza was living in Odessa in May 2010. (6) Daughter Yolanda Baeza was living in Fort Stockton in May 2010. Her married name is Saucedo. K. Son Elfidio Baeza was born in Castolon March 3, 1924. L. Son Luis Granado Baeza was born September 7, 1928 in Texas. In 1976 he was living in Fort Stockton, where he was working as a rancher. He died December 26, 1976 in Joe’s Bar, Fort Stockton of a gunshot wound and was buried in St. Joseph’s Catholic Cemetery, Fort Stockton. 8. Son Fernando Baeza was born May 30, 1889. He married Rosenda Dominguez April 21, 1915 in the Chisos (St. Agnes) Church. Rosenda died in August 1940 in Nueva Rosita, Coahuila, Mexico, Fernando died in Monclova, Coahuila in 1972. (1) Son Jose Alberto Martinez was born in 1935 in Sacramento, Coahuila, Mexico. He died in Eagle Pass, Texas. In 1958 he married Alicia Guerrero. They had four children. (2) Son Fernando Martinez was born in 1937. He married Rosalinda Osuna and they had five children. (3) Daughter Irma Martinez was born in 1940. She married Eloy Zuñiga and they had six children..
(4) Son Raul Martinez was born in 1948. He married Rebeca Perez and they had three children..
(1) Daughter Argentina Sanchez was born April 14, 1939. She died April 20, 2011 in Monclova, Coahuila, Mexico. She married Baldemar Gonzalez in October 1958 and they had four children. (2) Son Manuel Sanchez was born October 10, 1940. He married Idalia Garza January 11, 1969 and they had three children..
(3) Daughter Maria Angelica Sanchez was born March 28, 1942. She married Agustin Gutierrez and they had five children..
(4) Son Enrique Sanchez was born October 18, 1943. He married Elvia Vera in November 1966 and they had four children. (6) Daughter Maria del Refugio Sanchez was born July 5, 1948. She married Mario Joaquin Castaño and they had three children. (7) Son Jose Luis Sanchez was born September 21, 1950. In 1970 he married Lilia del Carmen Gonzalez and they had three children. (8) Son Hector Fernando Sanchez was born April 9, 1953. He married Laura Villasana in October 1981 and they had two children. (9) Son Sergio Sanchez was born November 9, 1959. He married Adriana Rivas in September 1987 and they had three children. (1) Son Juan Magdaleno Marquez was born in Terlingua July 21, 1948. (2) Daughter Elizabeth Marquez was born in Alpine June 28, 1949. (3) Daughter Linda Ann Marquez was born in Alpine November 23, 1951. (4) Daughter Maria Estella Marquez was born in Pecos January 19, 1953. (5) Son Concepcion Marquez was born in Odessa July 27, 1957. (1) Daughter Indra Patricia De Anda was born in 1957. (1) Daughter Carol Trevino was born March 15, 1961. E. Son Mateo Baeza, also known as Timoteo Baeza, was born September 21, 1926 in Boquillas del Carmen, Coahuila, Mexico. (1) Daughter Maria Baeza. In January 2010 she was living in Houston, Texas. (2) Daughter Norma Baeza. In January 2010 she was living in California. (3) Daughter Teresa Baeza. In January 2010 she was living in Midland, Texas. (4) Daughter Rosa Baeza. In January 2010 she was living in Midland. (5) Daughter Alma Baeza. In January 2010 she was living in Midland. (6) Daughter Lilia Baeza. In January 2010 she was living in San Antonio, Texas. Her married name is Rodriguez. (7) Daughter Herlinda Baeza. In January 2010 she was living in San Antonio. (8) Daughter Rosenda Baeza. In January 2010 she was living in Andrews, Texas. Her married name is Gomez. (9) Daughter Argentina Baeza. In January 2010 she was living in Michigan. Her married name is Castellanos. (10) Daughter Raquel Baeza. In January 2010 she was living in Michigan. Her married name is Vargas. (11) Son Fernando Baeza was living in Houston in January 2010. (12) Son Juan Baeza was living in Houston in January 2010. (13) Son Raul Baeza was living in Michigan in January 2010. (14) Son Julio Baeza was living in Michigan in January 2010. (15) Son Asael Baeza was living in San Antonio In January 2010. 9. Daughter Teresa Baeza was born in Santa Helena, Chihuahua, Mexico November 4, 1892. She married Guadalupe Hernandez, son of Cipriano Hernandez and Juana Silvas, in Castolon August 12, 1913. He was born in Shafter, Texas December 12, 1895 and moved with his family to the Castolon area around 1900. In his adult life he operated a general store and farmed in Terlingua de Abajo. He later farmed, ranched and operated a general store on what is now the Evelyn Fulcher property, upstream from Terlingua de Abajo, and eventually moved to Marathon, where he also owned and operated a general store. Teresa died of Pneumonia in Medical Center Hospital, Odessa November 24, 1974. Guadalupe died in Marathon December 7, 1971. Both are buried in the Marathon Cemetery. A. Son Domingo Hernandez was born August 4, 1914, probably in Castolon. He and Leonor Rodriguez had one child together. (1) Daughter Delia Rodriguez was born December 2, 1944 in Brewster County. (1) Son Daniel Hernandez was born March 2, 1947. He died February 12, 1964 when the truck in which he was riding overturned on a highway south of Marathon. He is buried in the Marathon Cemetery. (2) Daughter Dora Victorino Hernandez was born April 1, 1948, probably in Marathon. (3) Daughter Anita Hernandez was born November 5, 1949, probably in Marathon. (5) Son Gilberto Hernandez was born October 14, 1953, probably in Marathon. a. Son Israel Hernandez McGuire, Jr. was born February 4, 1961 in Brewster County. b. Son Eric Hernandez McGuire was born August 28, 1964 in Brewster County. c. Son Joel Hernandez McGuire was born February 28, 1967 in Brewster County. B. Son Cipriano Hernandez was born September 16, 1915, probably in Castolon. He died in an accident in the Chisos Mining Company coal mine May 10, 1933. He is probably buried in Terlingua de Abajo. The Hernandez family sued the Chisos Mining Company for $30,000 in damages. The court ruled in favor of the family, but the final award was reduced to $1,400. (2) Daughter Amparo Mata was born August 25, 1950 in Reeves County, Texas. (3) Son Francisco “Frank” Mata was born August 12, 1954 in Reeves County..
(1) Son Abundio “Leo” Martinez was born July 11, 1940 in Brewster County. In June 1993 he was living in Odessa. (3) Son Antonio Hernandez Martinez was born September 2, 1953. In June 1993 he was living in Odessa. (4) Daughter Elisa Hernandez Martinez was born July 21, 1960 in Brewster County. In June 1993 she was living In Austin, Texas. Her married name is Hastings. (5) Daughter Dalia Martinez was living in Odessa in June 1993. Her married name is Weeks. (1) Son Guadalupe Molinar was born May 30, 1943 in Brewster County. (2) Daughter Viola Molinar was born July 4, 1946 in Brewster County. (3) Daughter Sulema Molinar was born October 6, 1948 in Brewster County. (4) Daughter Elma Molinar was born October 18, 1950 in Brewster County. (5) Son Juan “Johnny” Molinar was born October 10, 1965 in Brewster County. (6) Son Anastacio Molinar, Jr.
F. Daughter Felipa Hernandez was born in Terlingua de Abajo February 5, 1922. 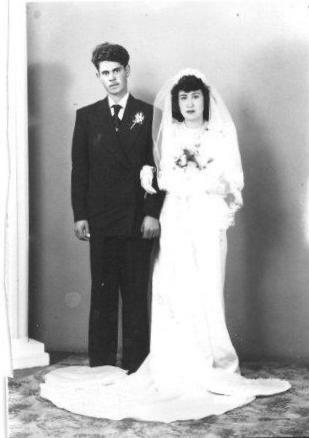 On September 8, 1945 she married Jose Arispe, son of Rumaldo Arispe and Inez Garza. He was born September 13, 1917 In Terlingua. In January 1989 they were living in Odessa, where Jose died October 8, 1996. Felipa died in Odessa March 11, 2011 and is buried in Rose Hill Cemetery. For more information on the Arispe family, please see http://www.lifebeforetheruins.com/rumaldo-arispe.html. Jose and Felipa had three children. (1) Daughter Anna Maria Arispe was born March 30, 1947 in Brewster County. She married Ponciano Torres. 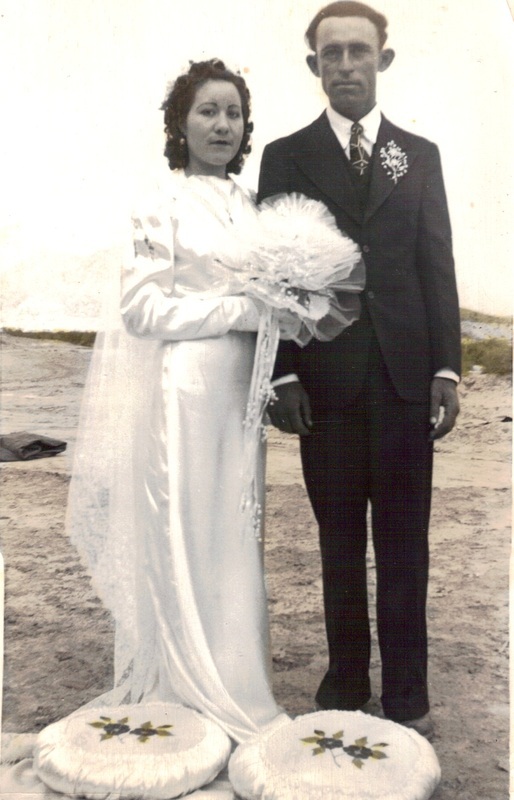 (2) Daughter Amalia Arispe married Santos Gonzales..
H. Daughter Josefina Hernandez was born March 12, 1923 in Terlingua de Abajo. On February 10, 1942 she married Juan G. Molinar, son of Juan Baeza Molinar and Zenaida Gonzalez. He was born in Terlingua February 22, 1916 and was baptized in Chisos by Father M. Cuadrado from St. Agnes Catholic Church in Terlingua. His godparents were Manuel Anaya and Sabina Aranda. For more information on the Molinar family, see http://www.lifebeforetheruins.com/antonio-molinar-2.html Josefina and Juan had four children. (1) Son Octavio Molinar was born September 11, 1944 in Brewster County. (2) Daughter Gloria Molinar was born in Alpine August 31, 1947. She died of Rheumatic Fever in Fort Davis Hospital January 3, 1955 and is buried in Holy Angels Cemetery, Alpine. (3) Daughter Oralia Molinar was born February 12, 1949 in Brewster County. She married Simon Grado and in January 2012 they were living in Fairbanks, Alaska. (4) Son Ruben Molinar was born May 29, 1953 in Brewster County. (1) Son Santiago Hinojos, Jr.
(2) Daughter Ermidea H. Hinojos was born April 7, 1949 in Ector County. (3) Son Ismael Hernandez Hinojos was born April 9, 1952 in Ector County. (4) Son Rudolfo Hinojos was born January 13, 1957 in Ector County. (5) Daughter Hilda Hinojos was born July 26, 1958 in Ector County. (6) Son Hector Hinojos was born July 30, 1960 in Ector County. (7) Son Osmundo Hinojos was born June 27, 1962 in Ector County. (8) Daughter Norma Hinojos was born June 15, 1964 in Ector County. (9) Daughter Consuelo Hinojos was born August 22, 1966 in Ector County. J. Son Lacislos Hernandez was born September 3, 1930 and died the following day. He is buried in Terlingua de Abajo. (1) Son Alfredo “Freddy” Hernandez was born October 1949. He was a Vietnam Veteran and worked as a foreman for Southern Pacific Railroad. He died in Seabury Nursing Home in Odessa February 28, 2008 and is buried in the Marathon Cemetery. a. Daughter Diane Hernandez Villarreal was born May 26, 1971 in Brewster County. In February 2008 she was living in Dallas. b. Daughter Denise Villarreal was born September 23, 1978 in Ector County. In February 2008 she was living in Odessa. c. Son Manuel Villarreal, Jr. was born August 16, 1983 in Ector County. In February 2008 he was living in Odessa. a. Daughter Sabrina Cordova was born January 22, 1974 in Brewster County. In February 2008 she was living in Austin. b. Daughter Amy Cordova was born December 19, 1977 in Ector County. In February 2008 she was living in Dallas. (1) Son Eliseo Riojos, Jr.
(2) Daughter Susana Riojos. Her married name is Harmon. (5) Daughter Linda Riojos. Her married name is Martinez. (1) Son Martin Baeza was living in Fort Stockton in September 2007. (2) Son Ramon Baeza was living in Odessa in September 2007. (3) Son Orlando Baeza was living in San Diego, Texas in September 2997. (4) Daughter Maria Baeza was living in Fort Stockton in September 2007. Her married name is De La O. (5) Daughter Guadalupe “:Lupe” Baeza was living in Fort Stockton in September 2007. Her married name is Garcia. B. Son Joaquin Baeza was living in Jal, New Mexico in October 2009. C. Son Inez Baeza was living in Jal, New Mexico in October 2009. D. Son Cornelio Baeza was living in Las Vegas, Nevada in October 2009. E. Daughter Braulia Baeza was living in Austin, Texas in October 2009. Her married name is Ramirez. F. Daughter Manuela Baeza was living in Ojinaga, Chihuahua, Mexico in October 2009. Her married name is Caballero. (1) Son Juan Baeza was living in Midland in October 2009. (2) Son Jesus Baeza was living in Midland in October 2009. (3) Daughter Antonia Baeza was living in Midland in October 2009. Her married name is Tovar. (a) The original family name was Baeza, but Pablo's family, and some of Candelario's family, used Baiza. (b) The event was recorded in the Terlingua Church records, but the site was not specified. · Baptism and marriage records from Jesus Nazareno Temple, Ojinaga, Chihuahua, Mexico accessed via the FamilySearch web site. · 1880, 1920, 1930 census. · Family information provided by Elizabeth Marquez, Manuel Baeza Sanchez, Erika Nikole Celaya, Joe Luis Baeza, and others. · Personal testimony to the author. · Telesforo Baeza obituary, Midland Reporter-Telegram, January 13, 2010. · Personal observations by the author (cemetery markers). · Quicksilver, by Kenneth Baxter Ragsdale, Texas A&M University Press, College Station, Texas. · The Magnificent Marathon Basin by AnneJo P. Wedin, NORTEX Press. · Alfredo Ortiz Hernandez obituary, Odessa American, 29 February 2008. · Josefa Sotelo Baiza obituary, Fort Stockton Pioneer, 7 February 2007. · Gabriel Chavarria obituary, Alpine Avalanche, July 26, 2007. · Julian Granado Baiza obituary, Fort Stockton Pioneer, May 20, 2010. · Margarito Gamboa obituary, Fort Stockton Pioneer, December 2, 2005. · Juan Galindo Martinez obituary, Alpine Avalanche, June 17, 1993. · Luciana B. Garcia obituary, Pecos County web site. · Manuel Baeza obituary, Big Bend Sentinel, January 20, 1994, Archives of the Big Bend Obituary Files. · Marcela Garcia Lechler obituary, unknown newspaper. · Dolores (Lola) Baiza Avila obituary, unknown newspaper. · Brewster County marriage records. · Candelario Muniz Baiza obituary, Midland Reporter-Telegram, December 12, 2010. · Regina Yharte obituary, Midland Reporter-Telegram, January 7, 2008. · The 1930 census for the state of Chihuahua, Mexico. · Ramon D. Baeza obituary, Odessa American, September 26, 2007. · Jacobo Baiza obituary, USTexGenWeb Archives Project, unknown newspaper.